Ok, so I’ve been bad and am extremely late on writing this post up, but as you may or may not have noticed, we’ve had a new patch drop this week… And I may have gotten distracted that I totally forgot about writing this post for today’s blog – so apologies for lateness! And yes, 5.4 is finally here, the final raid patch for this expansion where we end up fighting the big bad, Garrosh Hellscream. While we haven’t killed him yet, I have to say that overall the Siege of Orgrimmar is a fantastic raid with an excellent variety of bosses with different mechanics, and I can’t wait for the heroic versions of them (even on fights like Galakras where I get to complain more about how bad Hurricane and the nerfed Shooting Stars is than actually DPSing them). 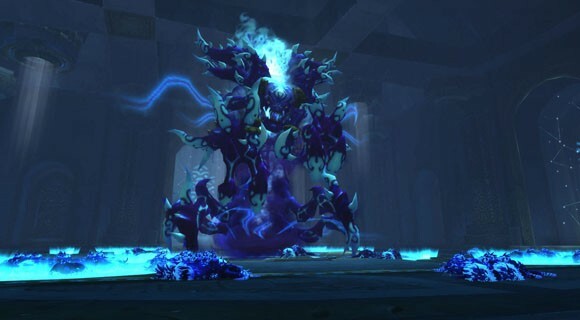 But yeah, we’re at 9/14 at the moment and despite how useless I feel on Galakras, so far I’d have to say the normal mode fight I’m most disappointed about was either Immerseus or Sha of Pride. Immerseus felt like Blizzard were trying to force too many healers into the fight, at least on normal mode – you need three in order to spread around the room, especially for phase 2, but the healing amount required was just meh, from what I’m led to believe from our healers. From a DPS perspective, there’s not an awful lot going on – moving void zones, constantly having to move because another void zone appeared underneath you, and then moving from mob to mob in phase 2 in order to get the damage buff… I picked a ranged class so that I can perform at ranged – especially in the case of Balance where WE DO NOT LIKE MOVEMENT! Sha of Pride on the other hand, is a fight where we don’t move much, unless we’re assigned to unlock people out of prisons. It is a particularly boring fight otherwise: stand out of bad, otherwise stack up, interrupt and kill the add when it spawns. Plus, ranking on that fight will be all about getting the Gift throughout the fight, especially when you have decent procs. The first wing of Flex also opened up this week, giving us the first four bosses of SoO. While I’ve only been there the once so far on my Druid, I can quite easily see it being a popular thing on OpenRaid, as well as an end-of-patch boosting mechanism, where we can run either an undergeared alt or recruit to bring them up to scratch for normal/heroic progression while still bringing the entire team to easily explain tactics to them. Plus, with achievements being earned through there, I’m sure my raid team will be happy with me not saying “Achievement?” for every boss fight I don’t have the Glory on. 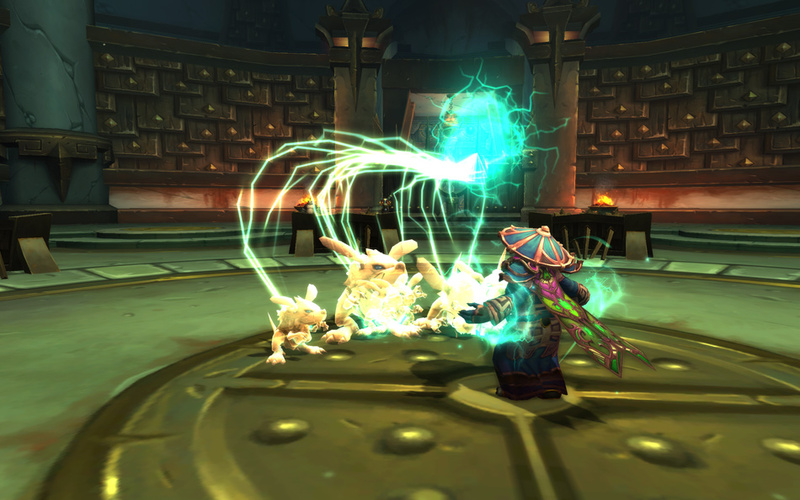 5.4 also brings us a new concept in the Proving Grounds, first promised to us last BlizzCon. It is essentially a training ground if you want to try out a new spec or a new role without the scrutiny of others weighing down on your back. Sure, DPS have always had the target dummies, but what about the tanks and the healers? They have to essentially practise their role when they’re already in group content, and I know that before I started tanking I was absolutely petrified of it. We had an awesome tank back in vanilla through to TBC that made it seem like cakewalk, however when I tried it for myself, and I realised that I had to set the pace for the group, watch healers’ mana before pulling the next pack, be mindful of how much I could take, etc, it was kind of nerve wracking. I did make huge mistakes, I’ll hold my hands up to it – even as a Paladin tank in TBC I messed up pulls in Shadowlabs and Shattered Halls – fortunately back then the community was a lot more understanding of people trying things out. I’d hate to learn a new role from scratch now. Fortunately, that’s where Proving Grounds has come in, and it’s come along at an excellent time with the Timeless Isle also being included in this patch (more on that later) to bring more alts into the foray. While I’ve only tried the DPS and Healer ones at around 2am both times so far, I have to say they are a suitable challenge once you get to Gold and Endless. For those that don’t know what happens in them – you essentially get a reforge vendor, an NPC to buy food and drink (no proper stat food – though I wouldn’t mind a Proving Ground-only version that gets removed once you leave) and you get all raid buffs, while the enemies get all raid debuffs. However your gear is scaled down to 463, same rules as Challenge Modes (so no legendary metas, gems don’t scale down, etc). You then go through a series of waves: 5 at Bronze, 8 at Silver and 10 at Gold, to earn achievements and practise the spec or role. On both the tanking and DPS I managed to one-shot both Bronze and Silver, while at Gold I seem to be stuck on waves 7 or 8 before I lose focus from the lack of sleep and step in the wrong place and screw everything up (only once got to Wave 10 and I screwed up by not having any burst ready). As I said, a suitable challenge – it was only once I got to bed that I realised I could have used a completely different talent choice to make things an awful lot easier. But yeah – DPS on the move again, only this time without 14k crit rating to help boost my Starsurge procs and with much lower spellpower to make Moonfire spam worthwhile. I also dislike the banshees spawning underneath a trapped mob that then becomes difficult to target and kill… On the move. 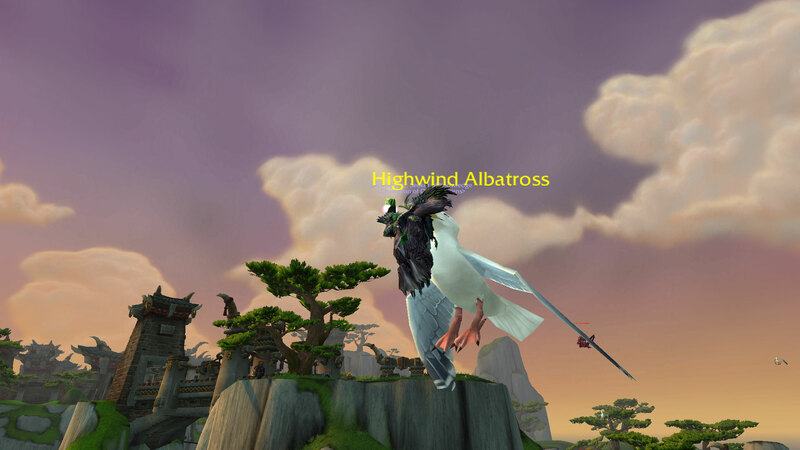 Another major addition to the game in 5.4 is the introduction of the Timeless Isle… And I am loving it there! I’m sure I will get burned out and never return once I’ve gotten the achievements (Ugh@Going To Need a Bigger Bag) but ironically it’s not going to be a timeless feature of the game. We will have to leave at some point, for example. The Celestial Court is brilliant this week too, as when people defeat all four of the Celestials, it’s a quick relog between four of my alts to get a quick tap and chance at loot each week. The lack of dailies is also fantastic, firstly for making a change from the rest of this expansion, but also because you can go at your own pace and do the things that you want to do, not what the game tells you to do. Sure, there’s the daily to kill elites and the lore daily, but other than that you can either farm up reputation with Shaohao from the yaungol, you can go rare hunting, you can go chest hunting, you can try to gear up your low-geared alts or soon-to-be-90’s with the different BoA armor tokens (though do note you have a higher chance to drop armor tokens of your armor class than of others, so for example my leather pieces that seem to be dropping all the time are being sent to my level 67 Monk, as I have no other level 90 leather wearers). As pictured in the header of the article above however, one of the more annoying aspects of the Isle (now half-fixed) is the way to get to certain chests or rare spawns. Tapping an Albatross allows you to take a tour of the Isle… Very, very slowly – especially as the pickup point and where you need to go is pretty much the wrong way round the route. The trouble of it when it was first introduced, was that you’d be able to tap the Albatross, it’d kidnap you, and then the next tap on it would bring it to the floor and chase whoever tapped it the second time indefinitely until it’s killed. Cue the trolls when the bird flies you over the Celestial Court! Nevertheless, it was still amusing to see my Moonkin in the mouth of a much larger bird. 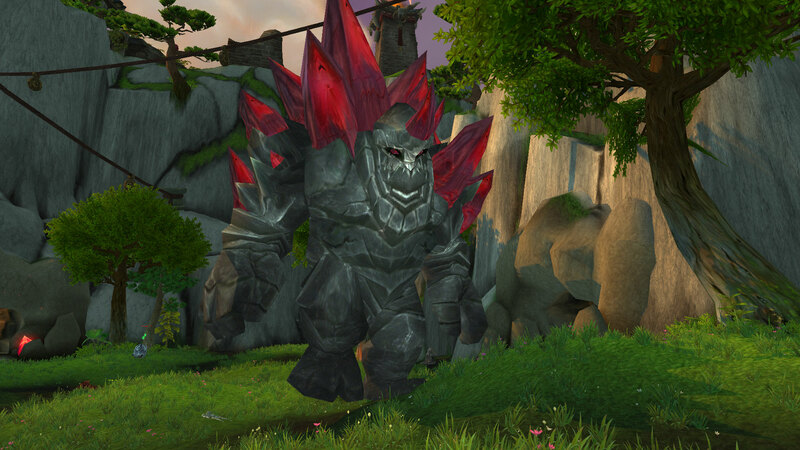 Also, the last rare I need is also related to the picture above… Who only spawns rarely instead of the red crystal rock giants – with mechanics unfriendly to both ranged and melee, the fact they don’t offer much in rewards and there only being 4 of them means that I’m going to be camping this area for a while before the fabled Golganarr spawns. How do you guys think 5.4 has been so far? Have you had a chance to check out all the different aspects of it? What are you eager to continue for the rest of the patch? Once again, sorry for the late post, and have a good weekend!